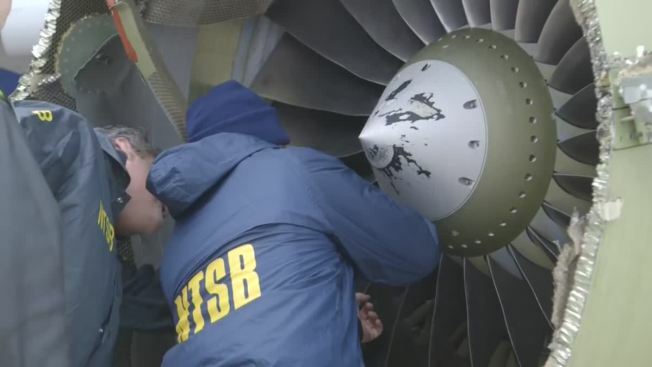 The NTSB is still investigating the April 17 accident, in which an engine fan blade broke and debris hit the plane, killing a woman who was blown partly out a broken window. The plane landed in Philadelphia. In April, a woman died after being partially sucked out of a Southwest airplane after engine failure while in mid-flight. The plane landed in Philadelphia. On Wedensday, the NTSB will question engine makers. There was a loud bang, and suddenly the Southwest Airlines jet rolled 41 degrees to the left. Smoke began to fill the cabin, and flight attendants rushed row by row to make sure all passengers could get oxygen from their masks. When flight attendant Rachel Fernheimer got to row 14, she saw a woman still restrained by her lap belt but with her head, torso and arm hanging out a window. Fernheimer grabbed one of the woman's legs while flight attendant Seanique Mallory grabbed her lower body. They described being unable to bring the woman back in the plane until two male passengers stepped in to help. 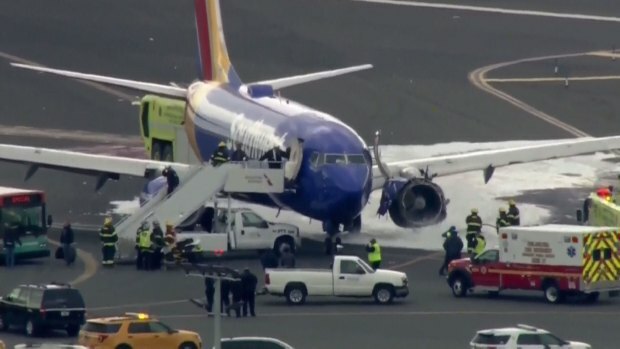 The harrowing details from the April fatal flight were released for the first time as the National Transportation Safety Board began a hearing Wednesday into the engine failure on Southwest Flight 1380, which carried 144 passengers and five crew members. After several failed attempts to reach the pilots by intercom because of the rush of air and noise, Mallory was finally able to relay the situation to Tammie Jo Shults and Darren Ellisor, who had already planned an emergency landing of the crippled Boeing 737-700 in Philadelphia. "We got (unintelligible words) a window open and somebody - is out the window," Mallory said. According to a transcript, she adds a little later, "Yeah everyone still in their seats, we have people have been helpin' her get in I don't know what her condition is, but the window is completely out." The flight attendants told investigators at least one of the male passengers put his arm out of the window and wrapped it around the woman's shoulder to help pull her back in. Fernheimer said when she looked out the window, she could see that one of the plane's engines was shattered, and there was blood on the outside of the aircraft. The passenger in the window seat, Jennifer Riordan, was fatally injured — the first death on a U.S. airline flight since 2009. Eight other passengers including at least one of the men who helped pull Riordan back in the window, suffered minor injuries. One of the men, an EMT in Texas, and a retired school nurse began CPR on Riordan, but according to interviews with investigators, they said her injuries seemed too severe. Emergency personnel took over once the plane landed, and passengers gathered her belongings to send with them. The accident was triggered by an engine fan blade that broke off. A piece of engine cover struck and shattered the window next to Riordan, a 43-year-old mother of two from Albuquerque, New Mexico. Wednesday's hearing in Washington focused on design and inspection of fan blades on the engine, made by CFM International, a joint venture of General Electric and France's Safran S.A.
A spokeswoman for CFM said in an emailed statement Wednesday that the company could not comment on an active investigation, but noted that it had "responded aggressively" to complete blade inspections after the fatal flight before an Aug. 31 deadline. The blade that broke had made about 32,000 flights. An examination indicated that it probably was beginning to suffer cracks from metal fatigue when it was last inspected in 2012, said Mark Habedank, an engineering official at CFM. But the crack was smaller than could be detected by the test used at the time, which used fluorescent dye. After the fatal accident, CFM recommended the use of more sophisticated tests using ultrasound or electrical currents. The company also recommended much more frequent inspections and lubrication of the blades. A broken fan blade had triggered a similar engine failure with shrapnel on another Southwest flight, in August 2016 over Florida. An FAA expert on engines, Christopher Spinney, said the agency considered the Florida incident "very unexpected." "We determined early that we would require some corrective action in that it was an unsafe condition," Spinney said, "but we also determined we had some time." Rather than issue an emergency order for fan blade inspections after the 2016 incident, the FAA began a normal process for new regulations, which includes a chance for the public to comment and takes longer. That process was still underway when the fatal accident occurred. Fan blades have been thought to have no real lifetime limit. CFM and FAA officials said they were now considering whether blades must be replaced at some point even if they don't show wear. Representatives from CFM, Boeing and the Federal Aviation Administration were also expected to be questioned about design of the engine housing, which is supposed to prevent pieces from breaking loose.